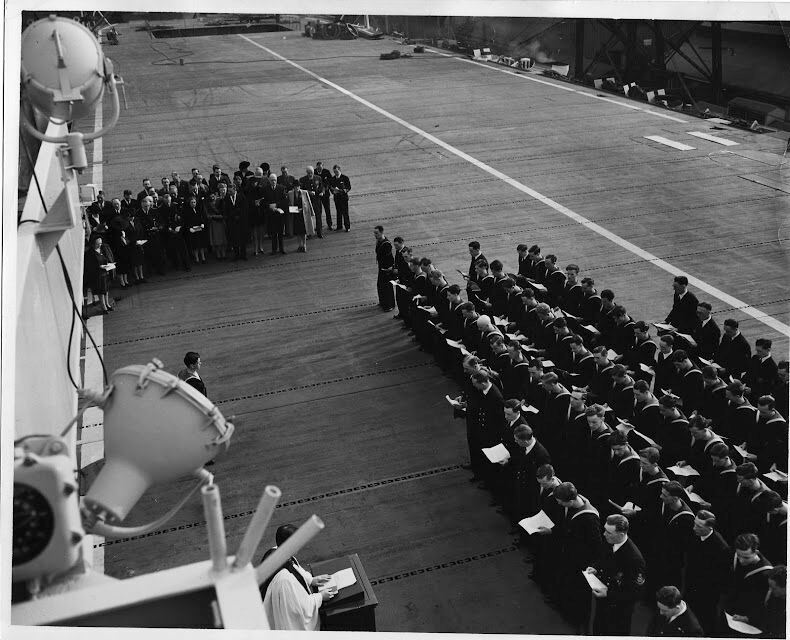 Above & below: The officers and men of HMS SMITER attend a dedication ceremony on the flight deck - the church service was led by The Right Reverend Sir Francis Heathcote, Bishop of New Westminster B.C and was attended by senior members of the Burrads staff. 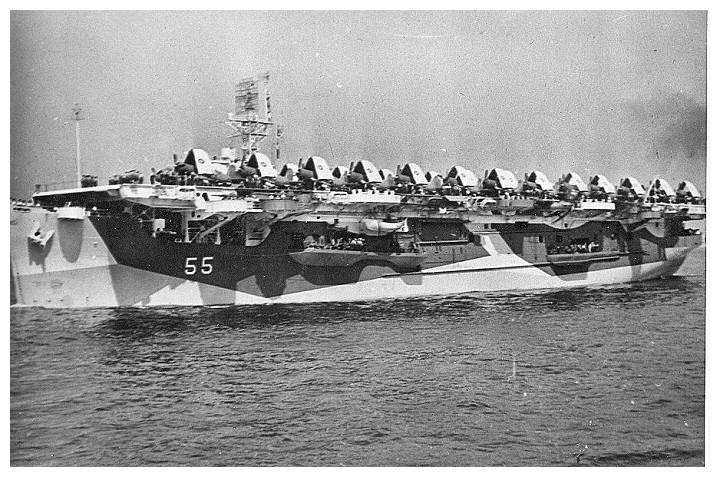 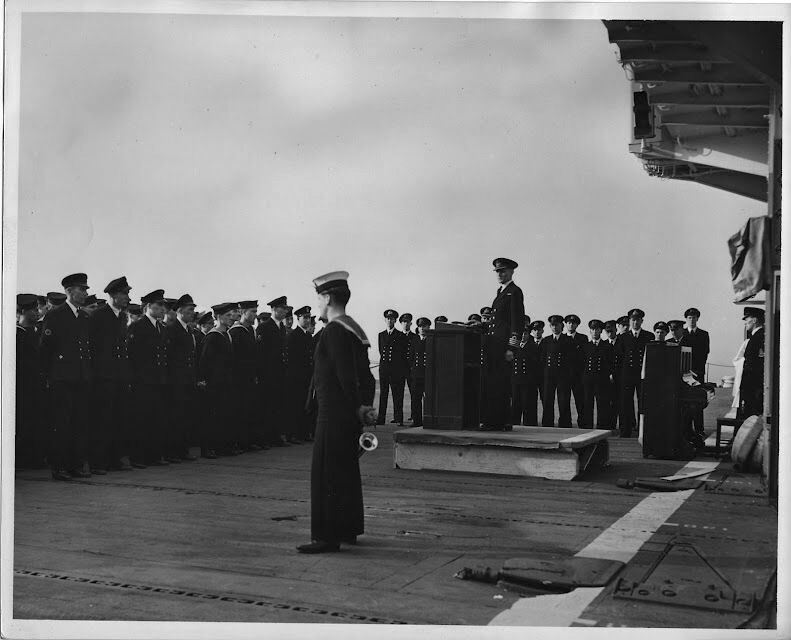 Captain L. G. Richardson entertaining guests o the hanger deck after the service. 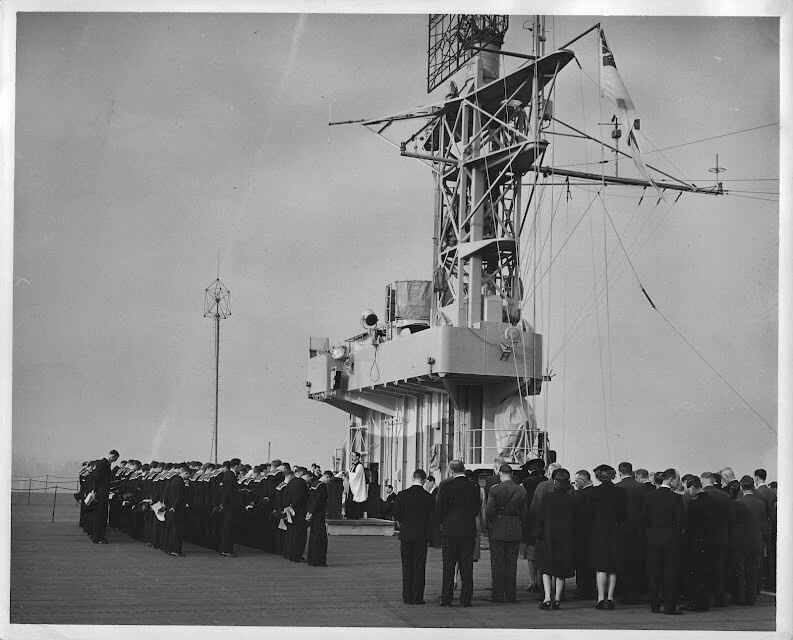 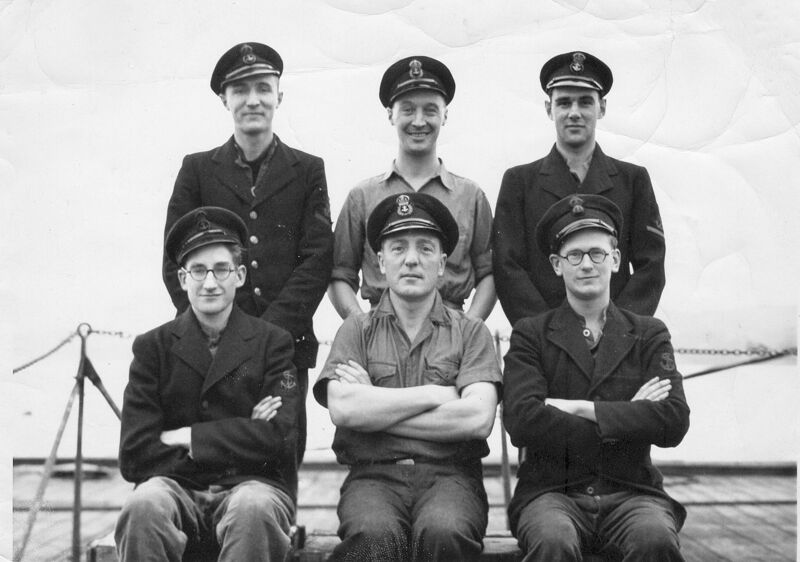 Officials and managers from the Burrads Dry Dock company, the yard that carried out the programme of modifications to the ship before she entered service with the RN. 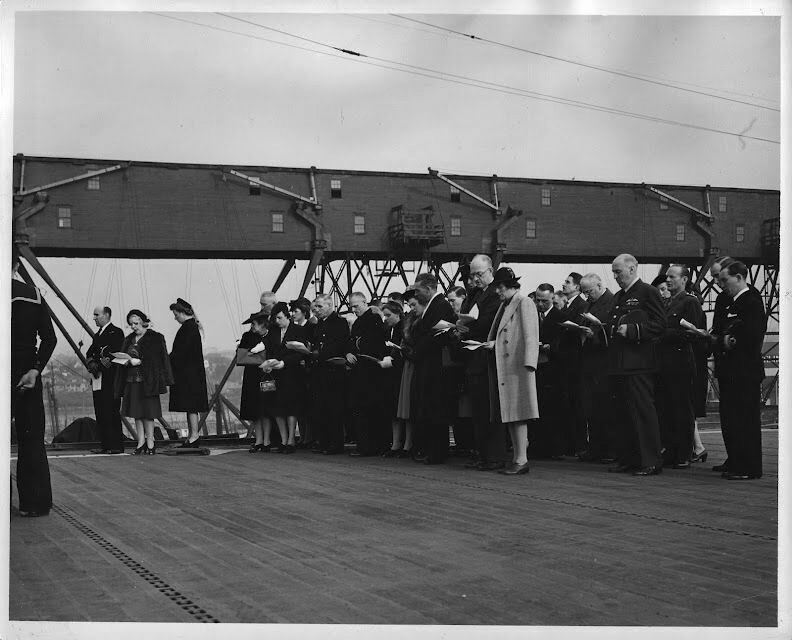 Esquimalt, Vancouver Island, British Colombia April 1944: The Governor of Canada, Major General Alexander Cambridge, Earl of Athlone and his wife Princess Alice and party on the flight deck during their visit to the ship. 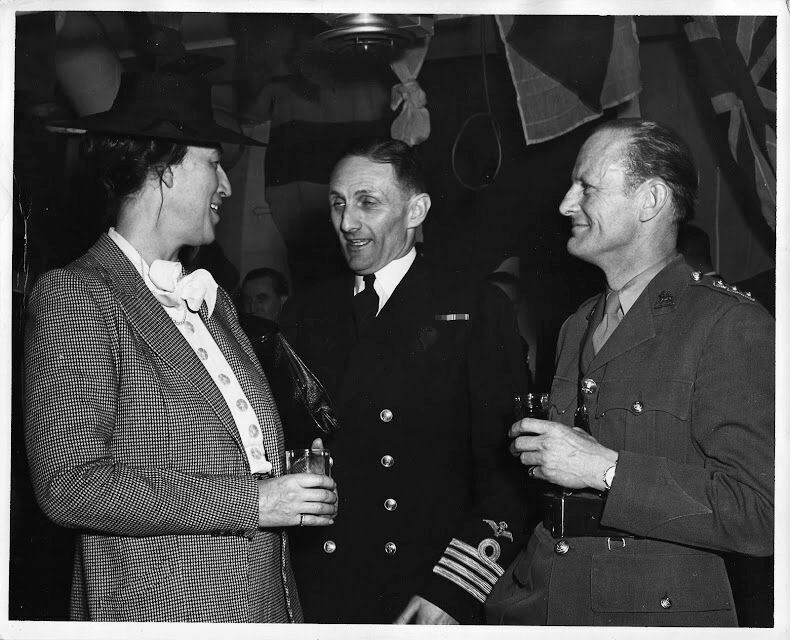 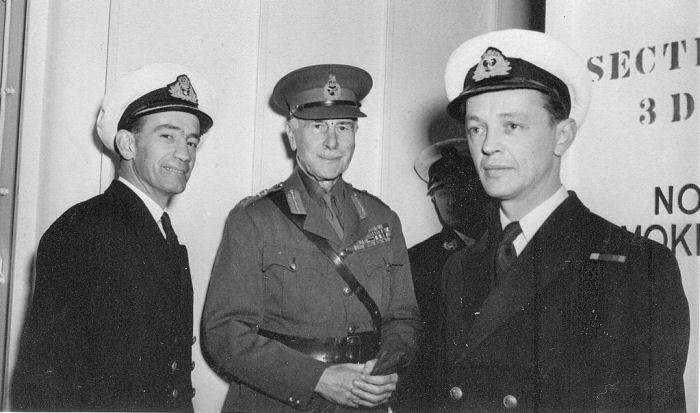 Esquimalt, Vancouver Island, British Colombia April 1944: The Governor of Canada, Major General Alexander Cambridge, Earl of Athlone with Captain Richardson (left); the Ship’s Doctor is in the foreground. 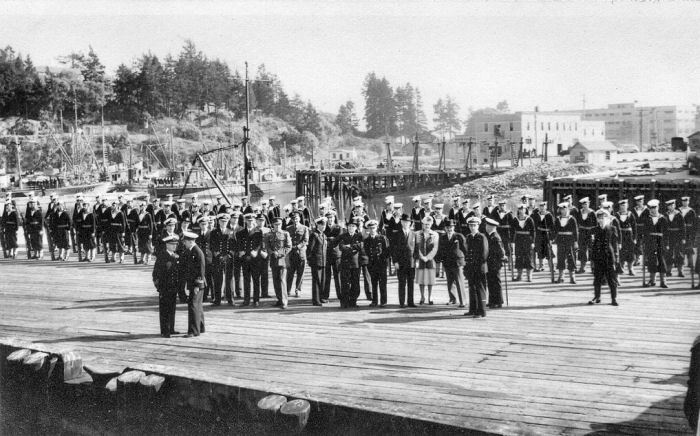 Esquimalt, Vancouver Island, British Colombia April 1944: The Guard of Honour awaits the arrival of the Governor of Canada and party on their official visit to the ship. 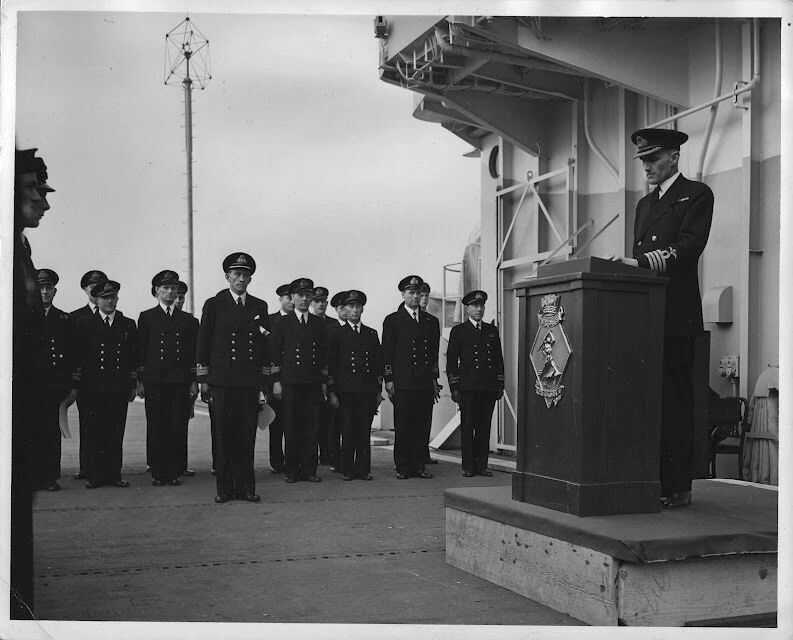 Esquimalt, Vancouver Island, British Colombia April 1944: Visit to the ship by the Governor of Canada, Major General Alexander Cambridge, Earl of Athlone and his wife Princess Alice. 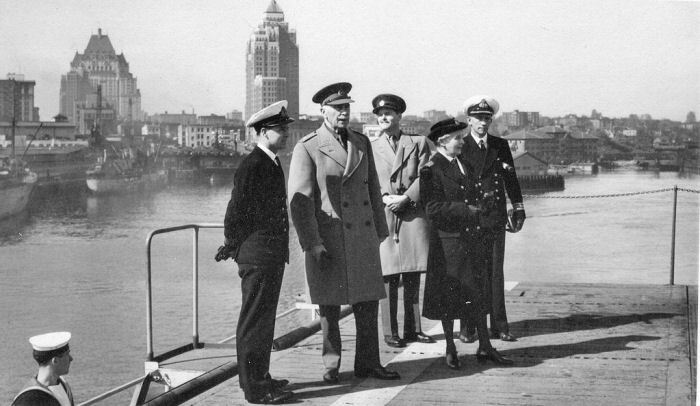 The ship’s company and senior officers on the flight deck; Captain Richardson is seated to the right of Princess Alice, Commander Pelly to the left of the Governor. 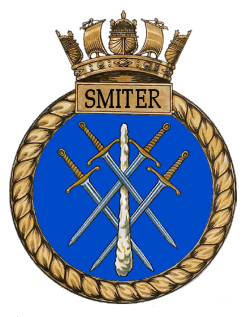 Firefox users please note - images may be condensed inside inline frames, a magnifying glass appears over the small image and it will return to its correct size when clicked. 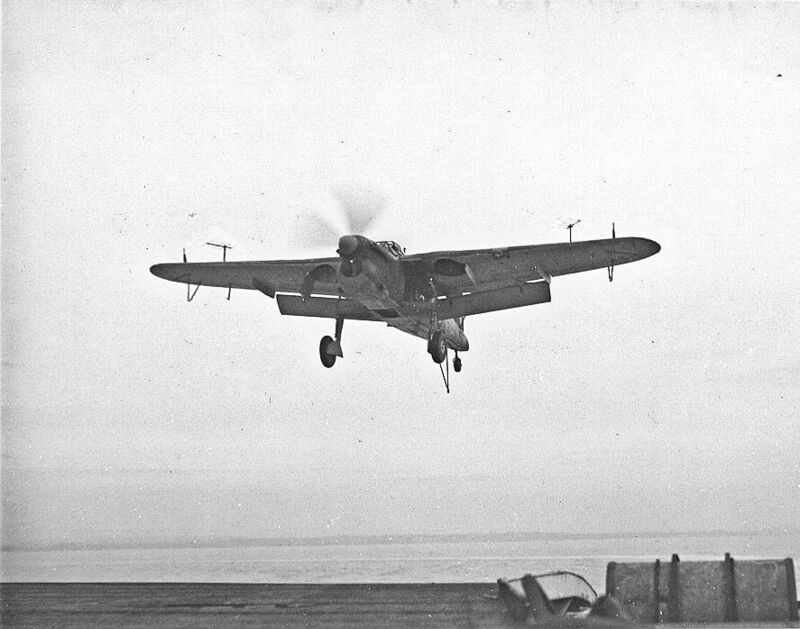 Full circle: a Swordfish of 768 Squadron takes off form SMITER in the Clyde exercise area, circles the ship and then approaches for a deck landing. 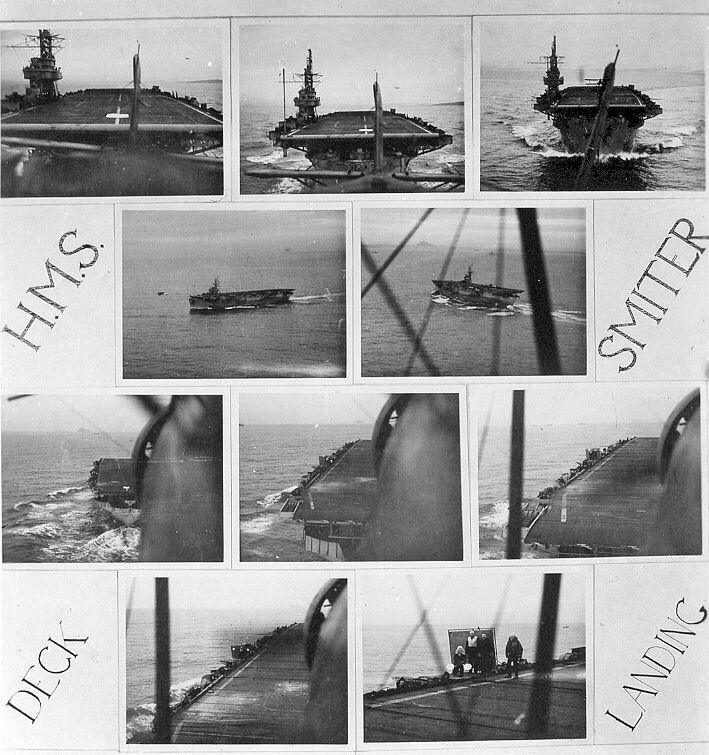 This sequence of photos shows how limited the pilot’s view of the deck is as he comes in to land. 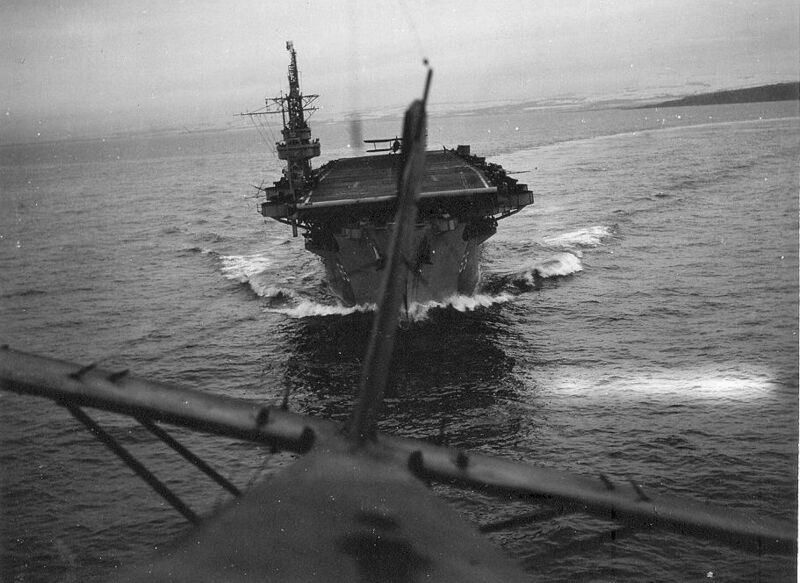 The Observers view from a Swordfish of 768 Squadron just after take off form SMITER in the Clyde exercise area. 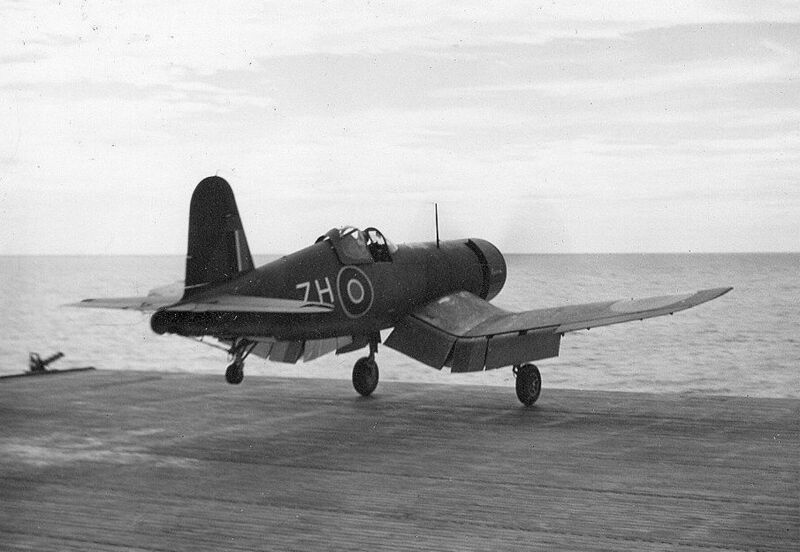 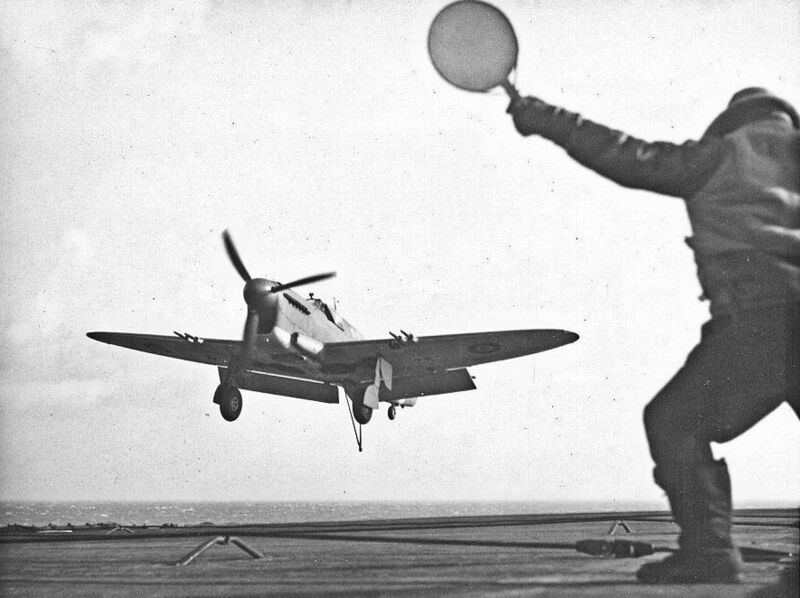 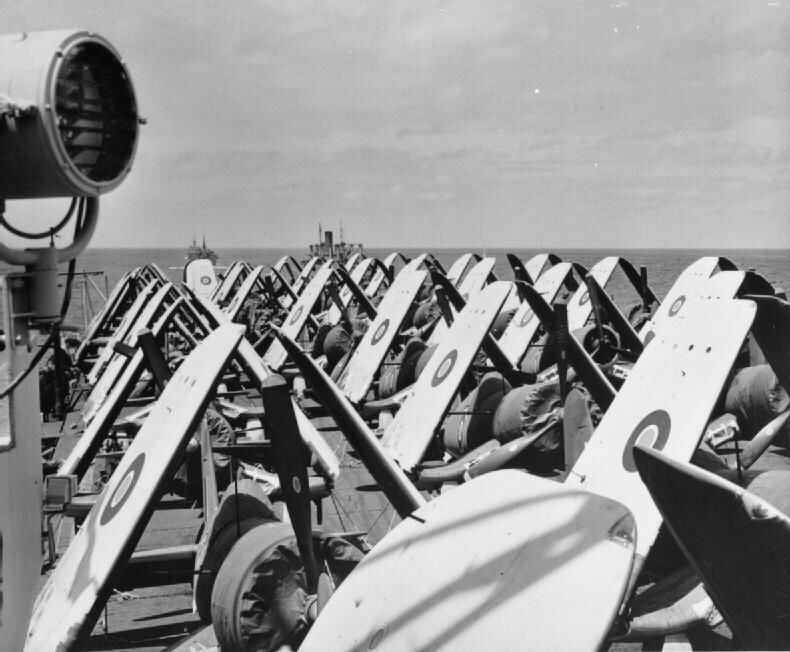 A second machine waits ready to follow at the start of a session of deck landing practice. 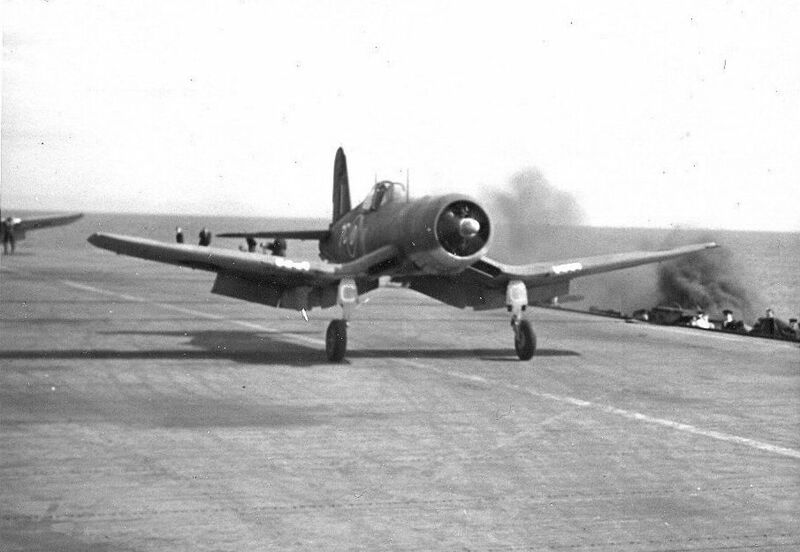 Above 8 next three pictures: Take offs and landings by Corsairs, a Firefly and aBarracuda. 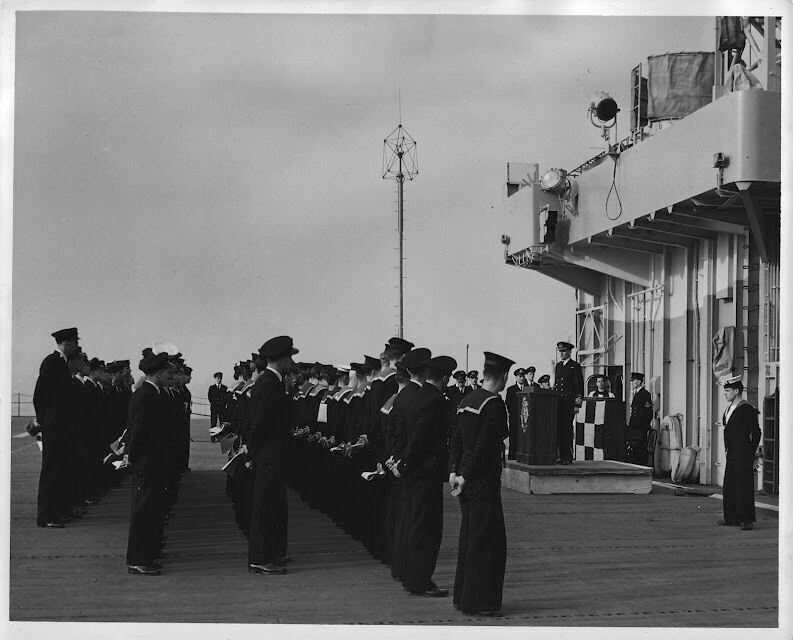 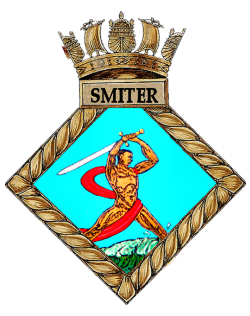 was the Navigating Officer; all other photographs on this page are from the album of Terry Oxley. 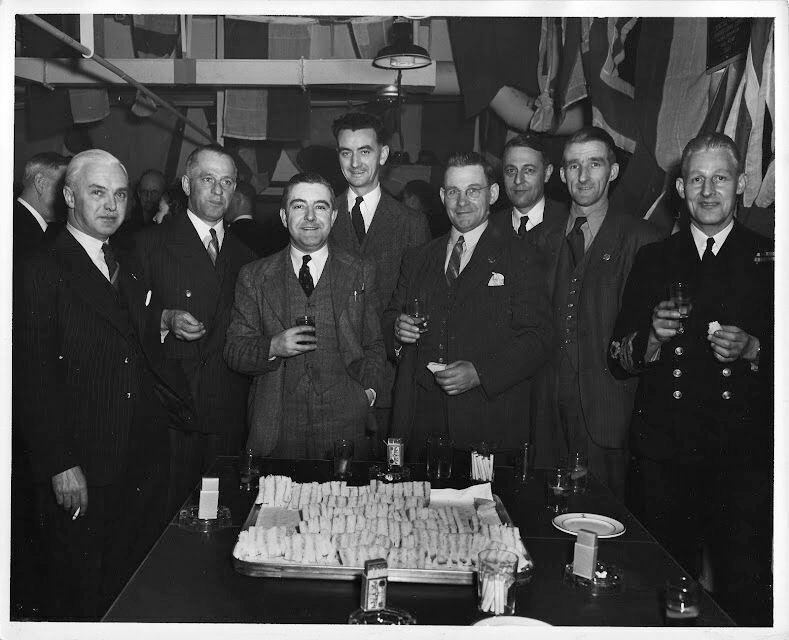 Additional information from Sam Howard whose Grandfather is in a number of these images.